← My Daily Spin – Am I Doing This Right? I’ve set myself a goal. Not only am I taking my silk – both spun and still in hankie form – I’m going to ask for help in plying it. The colors are so gorgeous, I don’t want to ply the different sets together, I want to ply each bobbin with itself. And I’ve had some challenges with that, so since I will have experienced spinners right there I’m going to take advantage of it. 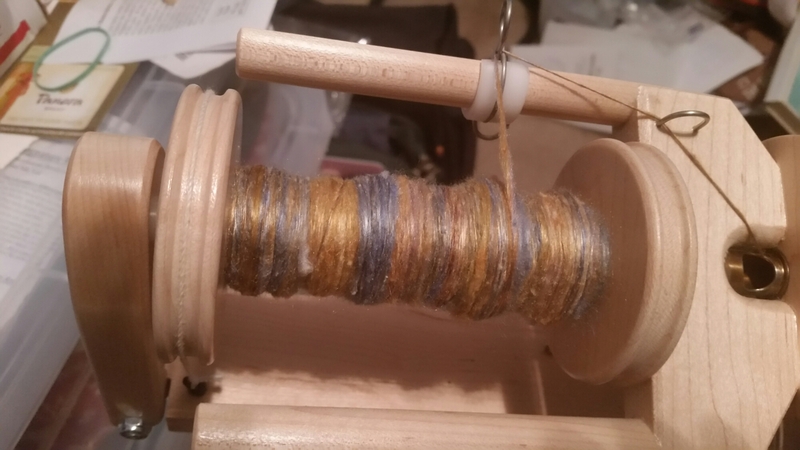 I’m almost done with the blue & gold hankies, they are so gorgeous on the bobbin. I will finish that up tomorrow. That leaves the purple & blue ones.